My Online Journal: I Got A Medal! 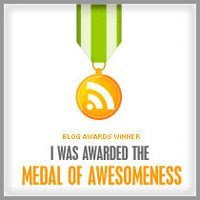 This medal of awesomeness award was given to me by Cecil. Thanks sis for thinking of me. Am I awesome? I think this word is most fitting in describing our Creator. He's awesome in all His creations in this world! I want to pass this medal to Tess, Norm, Nancy and Sarah. salamat po ng marami, ingat palagi!